A beautiful card, such a lovely colour. This is so elegant Sylvie it's simply adorable! Thanks so much for your continued support, and promotion, of our challenge. Oh this is so beautiful and gorgeous too. 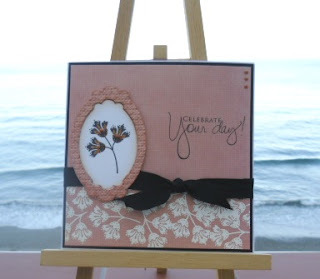 Beautiful card Sylvie and perfect for our challenge over at St Lukes charity card challenge. Thank you also for your contiued support. such a pretty card Sylvie, so elegant! Sylvie - this is beautiful! I really like the flower - and it makes a lovely border in white. Such a lovely combination the B/W and peach! Fabulous. Thanks for your continued support of St Luke's Charity Card Challenge! Lovely tones to this one, and I love the black accents! Fabulously elegant card Silvie. Thanks for joining us once again at St Lukes.